The 2014 version of the site. Not as fun as the earlier version below! 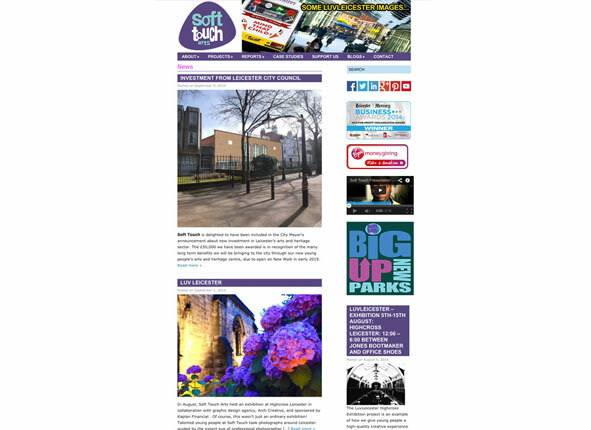 After running the Soft Touch website for many years, a potential conflict of interest meant that the re-design had to be handed over to another company with no connections to the charity. We will however continue to manage the various e-commerce elements of the site using WorldPay and Paypal. The featured image was the last incarnation of the site in Autumn 2014. The charity ensure the website is always on page one of Google by running many events, projects and ventures and ensuring that everything they do that is news worthy is featured in the local press as well as Social Media. Their new building on New Walk – Leicester’s first Youth Arts and Heritage Centre – was opened by HRH The Earl of Wessex. The high profile opening has meant an increase in both service users and partner agencies. In some ways I prefer the bottom image which was using our own CMS allowing users to go crazy and place images and text just where they wanted to!